Where can I buy a mechanical lock USB flash drive? From the first turn of the gear you will realize that this is no normal USB stick. A great way not only to protect the information, but also to add an element of a game into everyday life. Mechanical combination lock stores 32GB USB 3.0 flash drive. Only those who know the password can use it. This Round Lock Cryptex from the Russian designer Stanislav Tatarinov instantly revolutionizes the way you use and think about USB sticks. Sadly, the combination to unlock it, it is not customizable. But even with this issue in mind, this is a fantastic gift! 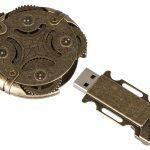 A USB flash drive is always handy, and with this coold and novelty design, it is the perfect gift for those steampunk fans! Buy this fantastic gift right now and get it delivered at your place! This entry was posted in Computers & Accessories and tagged cryptex, lock usb, mechanical lock, mechanical usb, stanislav tatarinov, steampunk on August 2, 2017 by WhereCanWeBuy.